Bolt comes with multiple example projects to get you started and inspired. We keep the core Bolt package entirely separate from these examples. That is, the plugin does not include the examples out of the box, and the examples don't include the plugin. This reduces the download size of Bolt lets you choose which version you want to use with the examples. All official example projects are found in the Learn Hub, under the Examples section. Full Projects: These examples are *.zip files containing a complete Unity project. This lets us include predefined Project Settings for things like input, physics, etc. Unity Packages: These examples are *.unitypackage files that can be imported in an existing Unity project. Each type of example has slightly different import steps. Download the example project ZIP file to any location on your computer. Extract all the contents under the same root folder, including the Assets, ProjectSettings and Packages folder. 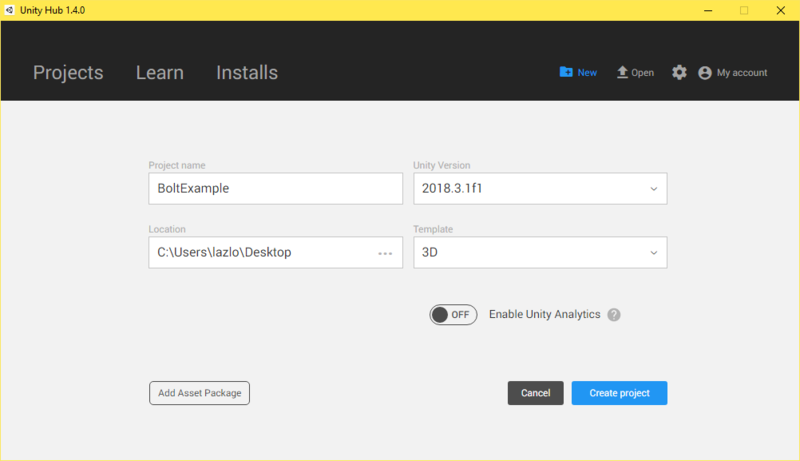 Open the project using the Unity Hub. Select the root folder from step 2 (the one that contains the Assets folder) as the path. All example projects were created with Unity 2017.4 in .NET 3.x for maximum compatibility, but they can easily be converted to another version. For Bolt 1, that is 2017.4 and above. For Bolt 2 Alpha, that is 2018.3 and above. 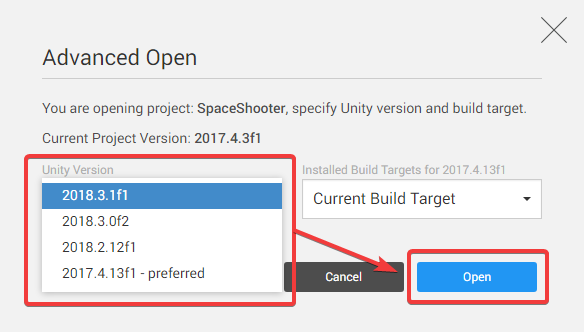 Once you selected your Unity version, hit Open and let Unity import the project. Open the root project folder with the hub. Choose your preferred Unity version. 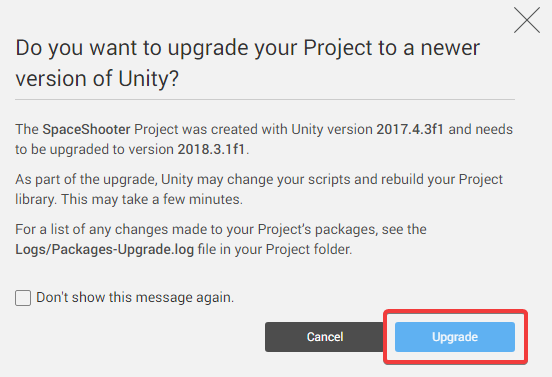 If prompted, let Unity upgrade the project. If you want to use .NET 4.x (optional for Bolt 1, required for Bolt 2), change the Scripting Runtime Version in the Project Settings now. You can find the setting under Edit > Project Settings... > Player > Configuration. 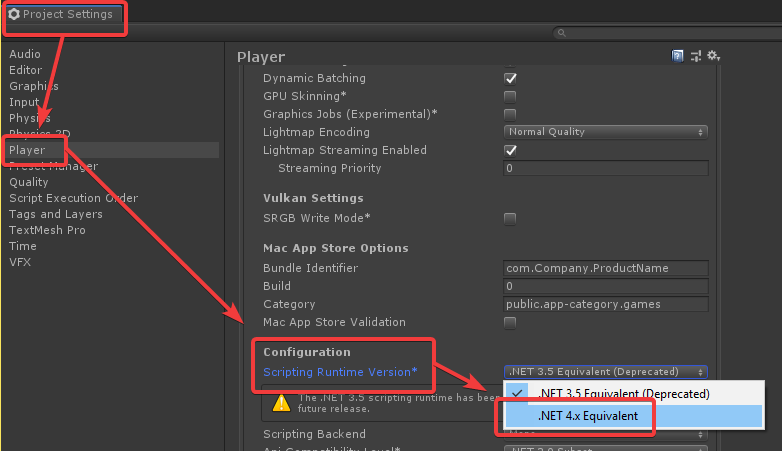 Change your scripting runtime version to .NET 4.x. Head over to the Download page and download the Bolt version that you want. You can also download Bolt from the Asset Store if you prefer (the Asset Store version is always the latest stable version available). 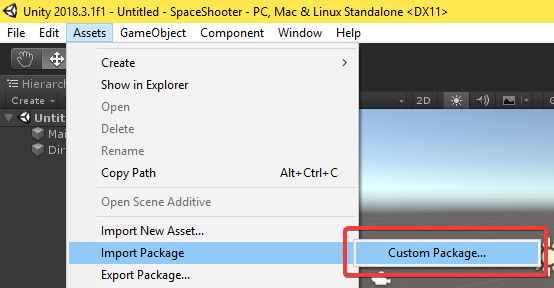 Then, import it in Unity with Assets > Import Package > Custom Package.... In this example, we are importing Bolt v.1.4.1b5. 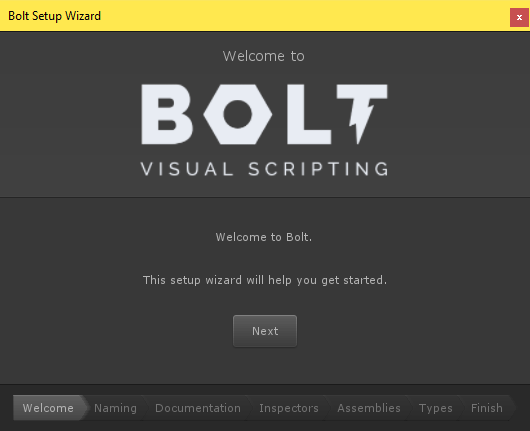 After importing, follow the setup wizard to configure the new Bolt install. 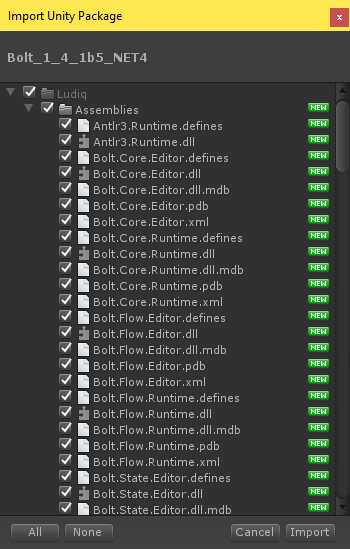 Restart Unity to to make sure it loads all Bolt assets and components properly. This is a precautionary step; usually, it should not be required, but due to various issues in different versions of Unity, it's safer to restart. 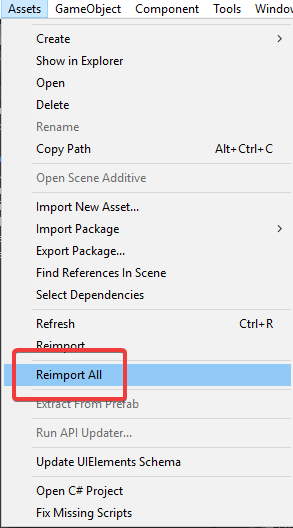 If you are using Unity 2018.3 and above, you need to Reimport all prefabs in the project. This is because all the prefabs in the example projects were created with 2017.4, using the old prefab workflow. Due to a known Unity issue, the prefab data will be corrupted in versions of Unity with the new nested prefab workflow (2018.3 and above). 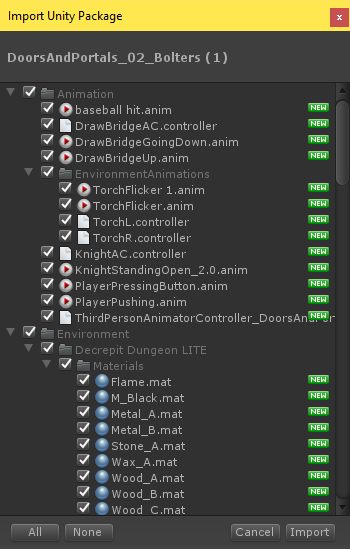 We recommend using Assets > Reimport All instead of manually selecting prefabs, just to make sure you didn't miss any. Note that a full reimport can be very long depending on the size of your project, but since example projects are usually small, it should be pretty fast. Reimport all assets in the project (recommended). Or manually choose the prefabs to reimport. If you imported a Bolt 2 Alpha, you will need to run the script reference resolver in Tools > Bolt > Fix Missing Scripts. After running the resolver, a Unity restart is required. Examples in Unity Packages need to be imported in existing projects. Note that projects created with Unity 2018.3 or above already use the .NET 4.x runtime by default. Head over to the Learn Hub and download the example package you want. 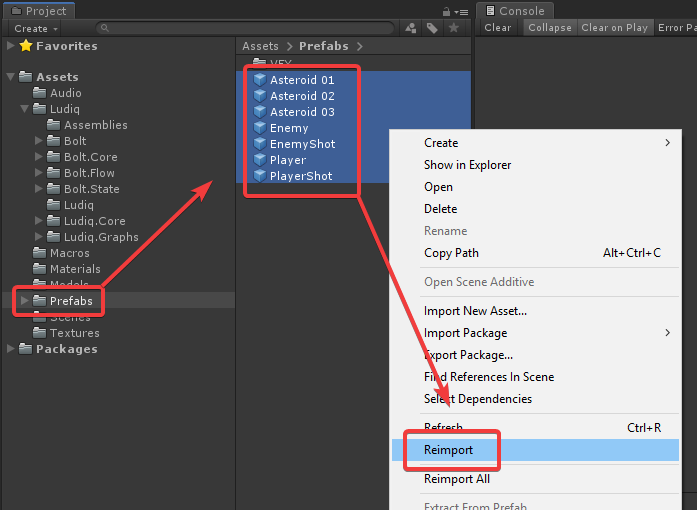 Then, import it in Unity with Assets > Import Package > Custom Package.... In this example, we are importing the Doors & Portals example. This article was helpful for 0 people.